This single was the official song of the Paralympics '94 which were held at Lillehammer, Norway. 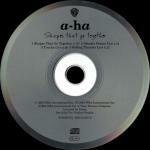 The single was written by Magne Furuholmen and Pål Waaktaar who from now onwards refers to himself as Paul Waaktaar-Savoy, produced by Christopher Neil and arranged by a-ha and Kjetil Bjerkestrand. The picture-sleeve of the 7"-release features a background in various shades of blue, green and black with a drawing of the Paralympics-emblem placed in the mid and upper part of the sleeve. 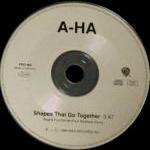 An a-ha-logo in different shades of grey plus the song title printed in white letters are placed below the emblem. Finally a small official Paralympics-logo is placed in the upper right hand corner. The reverse offers the same kind of coloured background. A 4�"x5" multicolour band-shot is placed in the centre, upon which additional information and the tracks are listed in small brownish red, green and blue letters. In addition to the 4:13-version of "Shapes That Go Together", the flip contains a remix by Rod Hui and Pål of "Cold As Stone" (4:32). The regular 5" CD-single comes in a jewel case and features an additional track, the instrumental version of "Shapes That Go Together" (4:23), but is otherwise identical to the 7"-release concerning both contents and sleeve layout. The spine is in green, blue and black, like the cover with white text. The German made disc is silver and green depicting the Paralympics-emblem, while the a-ha-logo and track listings are printed in white letters. The regular German made 3 track singles were also used for promotional purposes and come with a "Promotional Copy Only Not For Resale" sticker on the front. The sleeve and disc are otherwise the same as the regular release. The second 5" CD-single is a limited edition numbered CD. It comes in an album style case with a card insert. The front is in various shades of pinks and purples instead of greens and blues , but has the same cover design. It contains three 4�"x4�" photographic prints, one of each band member (taken from the video "Dark Is The Night"). The spine is black with white titles. 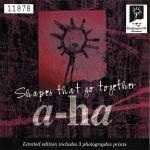 The CD is silver `matt effect' with black titles and a-ha-logo. The back cover of the CD is black with white text and has the same group picture as on the back of the 7". The tracks on the CD are the single version of "Shapes That Go Together" (4:13) and live versions of "Slender Frame" (4:05), "Touchy!" (6:46) and "Rolling Thunder" (6:13) taken from the video "Live In South America". The cassette single has cover similar to the 7" with the blue and green background continuing round the spine which features white titles. The inside of the cassette insert opens up with the picture found on the reverse of the 7" on a white background with the tracks written above in brown, purple and green. The cassette is black with white text and has the same tracks as on the 7". It plays the same both sides. Germany: The German 7" of "Shapes That Go Together" has a slightly different back sleeve compared to the UK release (the positioning of the bar code differs). 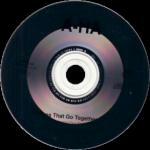 There are two different German made 1-track promo CD singles of "Shapes That Go Together". They both come in jewel cases and don't have picture sleeves. Some copies come with a white wea / Warner sleeve with black titles. The discs are both silver with black titles. One of the discs (PRCD 14) features the regular version of the song (4:13), the other (PRO 866) has a slightly edited version (3:47), missing the first part of the intro. The fact that this version is edited is not mentioned on the disc. Another collectable is "The Warner Music Collector 3" promo CD pressed in Germany. 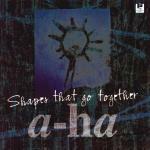 It is a special limited edition 16-track CD with a-ha's "Shapes That Go Together" (4:13) as track 1. The CD comes in a card-sleeve with The Warner Music Collector 3 printed on the cover. Japan: The 3"CD comes in an attractive snap-pack with a white cover. The same design as used for the UK 7" is placed at the top half of the sleeve, leaving a white border at the sides. Right below this is the colour band picture as used on the reverse of the 7". Underneath the picture there is green and black Japanese text. The reverse is white with black text and features the lyrics for "Shapes That Go Together" in English and Japanese plus a tiny black and white picture of "Memorial Beach". The CD is silver coloured with a black WB-logo and titles.